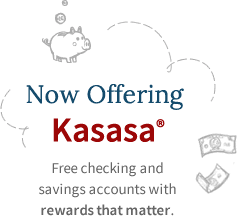 Automatic transfers from Kasasa Cash rewards for more saving power! An account that's affordable to open and pays a competitive interest rate. Get competitive tiered interest rates that increase as your balance does. Save a little throughout the year and be ready for your Christmas expenses! Every business needs a safety net. Open a savings account for peace of mind. A risk-free investment with higher returns than a regular savings account. Safeguard your family's future today.